Three candidates gunning for the California governor’s seat discussed youth issues Tuesday, May 15 in a community forum at the Los Angeles Trade-Technical College. The event, presented by the Children’s Defense Fund-California, The Children’s Partnership and The Chronicle of Social Change, hosted California State Treasurer John Chiang, former Los Angeles Mayor Antonio Villaraigosa and former California State Superintendent of Public Instruction Delaine Eastin as they debated a wide range of issues impacting youth including poverty, health, education, welfare, justice, and their perspectives of the future they envision for California children. According to the Children’s Partnership 2018 Election Guide, California is home to over 9 million children, nearly half of which live in or near poverty. In 2016, approximately 74,000 children were abused and neglected and 54,000 children were placed in foster care. Racial disparities have played an increasing role in the justice system processing, disproportionately affecting children of color. All of these combined statistics play a large role in not only the welfare of California’s youth, but also their future — and thus the state’s future — by creating obstacles in their education, development, and access to the resources students need to succeed. The other two candidates shared similar sentiments. He also went on to describe the importance of accountability and parental involvement within education. Chiang expressed his support for two years of free community college and lowering the cost of higher education. When asked about the California College Promise, known as Assembly Bill 19 in Sacramento before it was passed by Governor Jerry Brown last October, all three present candidates expressed support for the program. The California College Promise offers one year of free community college for all California residents. A step towards making college more affordable, this was one of few initiatives put forth by state legislature to address the looming issue of student debt in California. 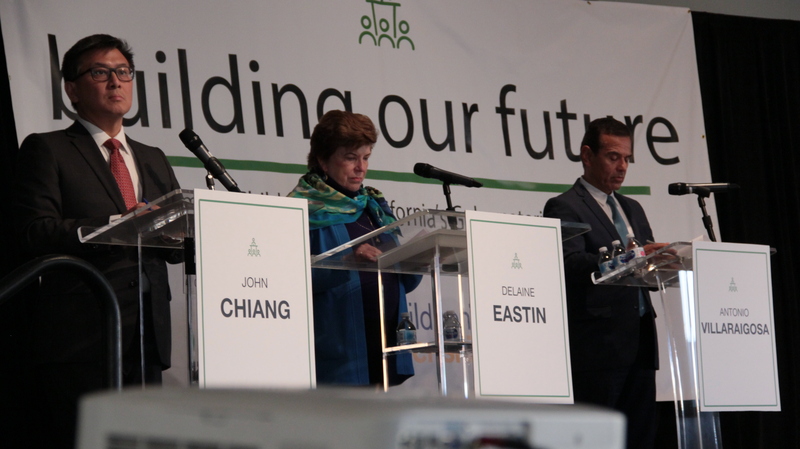 Eastin, on the other hand, identified specific statistics on higher education in California. With funds for the California College Promise currently being allocated for by Governor Brown for the 2019-2020 academic year, the candidate elected this November will inherit the program and have the choice of whether to continue or cease its efforts. In lieu of countless students attending community college for two years prior to transferring into a traditional four year university, this legislation is one of the first to push for waiving college tuition.